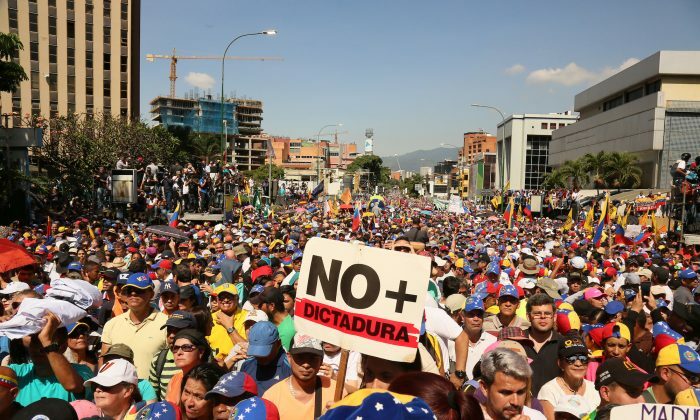 BOGOTA, Colombia—Tens of thousands of protesters took to the streets of remote towns and metropolitan cities across Venezuela on Feb. 2 to call for the resignation of Nicolas Maduro, who is facing growing pressure to step down as president. Despite suffering widespread food and medicine shortages alongside persistent power and water cuts, the scenes were of jubilation rather than despair. Crowds jumped up and down in streets and metro stations across Caracas waving the country’s tricolor flag and singing Venezuela’s national anthem lifted by a growing sentiment that the military-backed government could be in its last days. “Today, thanks to the support of the international community, hope flourishes in all of us and we expect a change in our country soon. Please, don’t abandon us,” said Vanessa Lloreda, 35, who took to the streets of Caracas to march for the restoration of democracy. Maduro simultaneously drew his own big crowd in central Caracas for the 20th anniversary of the Bolivarian—a socialist movement founded by the late Hugo Chavez—where he denounced what he called foreign violation of the nation’s sovereignty. “How long are they going to hurt the country? Enough of all the damage they’ve done to our country,” he told loyal crowds. The country is currently embroiled in an international power struggle with leader of the opposition and national congress, Juan Guiadó, having sworn himself in as interim president on Jan. 23 to the instant recognition of most Western nations including the United States. Maduro, who claims he is the victim of a coup directed by the United States, continues to rule thanks to the support of the military and a pro-Maduro filled constituent assembly which he created to sideline the opposition-controlled National Assembly, headed by Guiadó. Protests of discontent are not new with some 12,000 recorded in 2018 as dire conditions in the country deteriorated to untenable levels. But the marches on Feb. 2 are unprecedented in scale and in character, and point to a further drop in Maduro’s dwindling support. 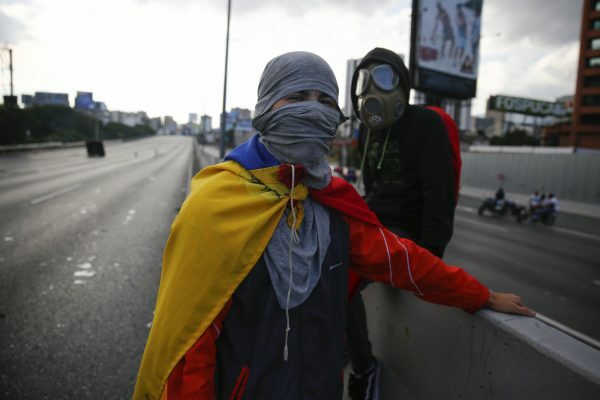 In recent weeks, protests broke out in neighborhoods previously deemed to hold an unshakeable loyalty to Maduro and the socialist revolution of his predecessor, Chavez. They also took place in small, remote towns such as Araure in western Venezuela, with a population of only 12,000. Recent crackdowns by special forces in working class neighborhoods have been widely reported in what appears to be an effort to intimidate the public as Maduro loses even hard-line Chavista supporters. For the first time during major protests, no violence was reported Feb. 2, and in the city of Barquisimeto, video footage captured police forces abandoning their posts after being hugged by protesters. The air of optimism was boosted by the defection that morning of General Francisco Yanez, an air force commander. “People of Venezuela, 90 percent of the armed forces of Venezuela are not with the dictator, they are with the people of Venezuela,” he said in a video that circulated on Twitter. But hopes that other military leaders would follow like dominoes were short-lived. Maduro announced to his supporters that he would call for new parliamentary elections earlier than planned, in a move to remove the opposition from the “bourgeois” National Assembly, a proposal that it will almost certainly reject. Ramsey says how much the opposition can hold sway is highly dependent on how much it can keep alive the frenzy that continues to draw mass crowds into the streets.